Hello Kitty is one of the most iconic toys in the world. The fictional creator, created by Japanese company Sanrio, was created primarily by Yuko Shimizu. The full name of the character is Kitty White. Although many view Hello Kitty as a toy, she is also a pioneer of great design. According to her backstory, Kitty is meant to be a perpetual third-grader living in London with her parents. The London location came about after Japanese schoolgirls became fascinated with the city and its style in the 1970’s. At various points in time, Hello Kitty has evolved and aged, even acquiring a boyfriend, Daniel, and a white cat pet (which is indeed strange). Hello Kitty has been licensed to create thousands of products. She started with a simple vinyl coin purse, which is now one of the most expensive toys in collecting. The cartoon kitten has a red bow in her mouth and also has now mouth (except for when Sanrio periodically lends the Hello Kitty character to productions and cartoons). Sanrio recently announced that Hello Kitty’s official birthday is November 1. The kitty is the primary example of what the Japanese call kawaii, which is a kind of incredible cuteness and smallness that is prized by Japanese popular culture. Hello Kitty earns Sanrio around $5 billion a year.She is now officially 43 years old. That’s a lot of yen! 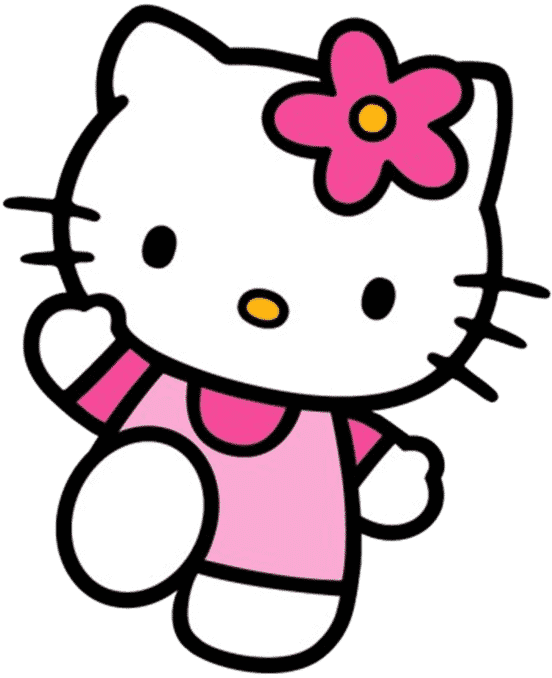 Although the original purpose of Hello Kitty was to sell toys and products to children, it has since expanded to include adults. After several decades, the stigma associated with adult collectors of children’s toys has dissipated, which is also evident in toys like Star Wars and or the popular Funko Pop line, which are mainly for adults. There are two Sanrio theme parks based on Hello Kitty: Harmonyland and Sanrio Puroland. The world erupted with excitement in 2018 when it was announced that Hello Kitty would become a Japanese bullet train. The Japan Times reported that West Japan Railway will honor Hello Kitty on a custom train that is designed to “send charm” and encourage unity across the nation. The first bullet train will appear on June 30, on the Sanyo Shinkansen Line operating between Osaka and Fukuoka. It will have eight 500-series cars. 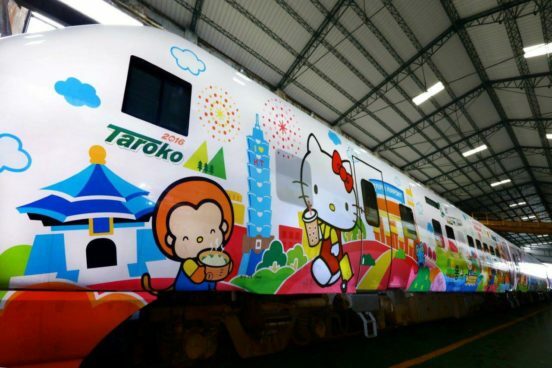 The exterior of the train will have cartoon images of Hello Kitty and her friends. The New York Post reports that it will run up to 200 mph. The immersive train will have many shades of pink on the interior, and has plenty of hearts and polka dots in the two cars. The first car will include a large Hello Kitty doll and a photo booth, perfectly designed for passengers to take selfies.The second car features a mini-market of Japanese products. 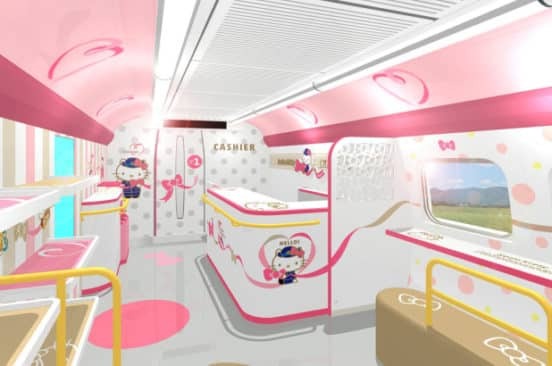 The train will make stops at each station between Shin-Osaka and Hakata, all the while playing the Hello Kitty theme song as it pulls into the stations. The Hello Kitty bullet train will run from June 30 to September 29, according to the Post. The trips are two-and-a-half hours. Hello Kitty fanatics should book their tickets now.